Whether you were just too eager to start your Stihl chain saw and pulled too hard on the starter rope or the rope simply wore out, at some point you will have to replace a broken starter rope. Replacement starter ropes are available at almost any hardware store. Replacing the starter rope is fairly easy, and you should be able to do the job with a couple of tools and a few minutes of your time. Press down the interlocking lever and the throttle simultaneously and set the master control lever to the cold starter position. Turn the chain saw shroud lock above the rear handle 90 degrees counterclockwise. Carefully lift off the shroud. Remove the screws from the hand guard and the fan housing using a Phillips screwdriver. Lift the hand guard and the fan housing off the chain saw to access the starter rope recoiling mount. Cut any remaining rope from the recoiling mount and pull it all the way out. Turn the recoiling mount counterclockwise seven to eight times, or until it's tight. Insert a metal pin to keep the recoiling mount from spinning back to the starting position. Run the new rope through the small guiding hole in the starter rope recoiling mount and tie it off with a basic overhand knot. Tie the other end of the starter rope to the pull handle. Remove the metal pin and turn the starter rope recoiling mount clockwise seven to eight times, or until it's tight. Screw the hand guard and fan cover back into position. If the starter rope is too long for a comfortable pull, simply cut the rope and retie it to the pull handle. Reattach the chain saw shroud and secure it in position by turning the lock on the bottom of the handle clockwise 90 degrees. Press down the throttle and interlocking lever simultaneously and set the chain saw master control lever to the warm start position. Test the new rope to make sure it works properly. 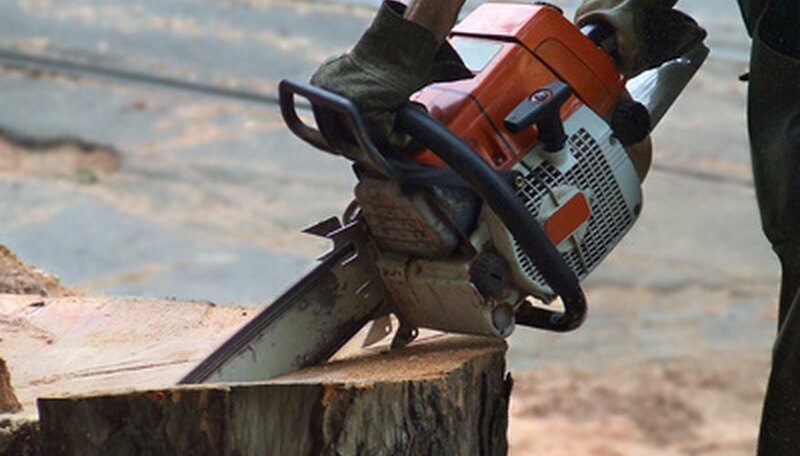 The starter rope will last longer if you pull it only in the specified direction, you never let it snap back, and you refrain from pulling out the entire rope when starting the chain saw. If these instructions do not work for your particular Stihl chain saw and you lost your original instructions manual, see Resources.